Nestled on four acres in the Cascade Mountains you can find this Hand-Hewn, Swedish-Cove 'Real' log home. The logs measure 14' plus with massive trusses and river rock wood stoves in Great Room and downstairs in the family room. We cater to families and couples. This home boasts 4000 square feet with spectacular views of Lake Cle Elum and the Cascade mountains. Its located in the Pine Loch Sun Beach Club subdivision. The kitchen is complete with everything you need to cook your favorite recipe. All pots and pans, dishes,bowls, cups, glasses flatware is included. Toaster, drip coffee maker or Keurig coffee maker , blender, mixer, electric griddle are included. The large dining area seats 10 comfortably at the all pine trestle table and chairs. All the beds are quality pillow-top mattresses and very comfortable! Linens and towels are provided. The downstairs has 3 bedrooms that boast log beds as well as a family room with a pool table. Bathrooms are complete with towels. Just bring your shampoo etc. show the history of coal mining and logging in the early 1900's.The popular TV series 'NORTHERN EXPOSURE' was filmed in Roslyn. Shop in nearby Cle Elum at Safeway for groceries. 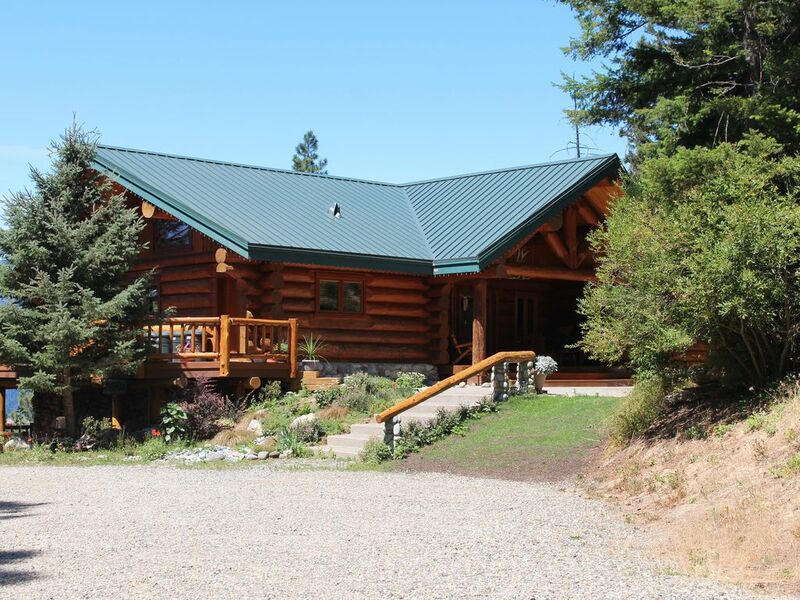 The Log Cabin at Lake Cle Elum is centrally located, just over one hour from Seattle, Wenatchee or Yakima. The world famous Bavarian City of Leavenworth is only an hour away. In the winter months, the cabin is accessible by snowmobile or snow cat. Roads are closed to cars and trucks. Makes sledding fun! Bring your own snowmobiles or rent them at The Last Resort Restaurant . Suncadia Resort is 5 miles away, complete with golf course and fine dining, spas, ice skating, bicycle riding and more. Keywords: Log Home on 4 acres of natural secluded forest land. A winter wonderland for snowmobilers. A summer haven for fishing, kayaking,boating and other water sports! We built this cabin in 1996 and have enjoyed it for years. It is very secluded and the views are absolutely awesome. We have three adult children and seven grandchildren who enjoy the log cabin all year around. We rent the log cabin to share it with the type of people who would enjoy this type of natural beauty. Birds, deer, turkeys, raccoons and even black bear stroll by out of curiosity. The little bit of income helps too! We hope you enjoy your stay. We chose to build our Log Home in this area because when the grey sky and weather on the west side of the mountains gets to depressing, we come over the Snoqualmie Pass and soon the sky is blue with white puffy clouds. You can look in your rear view mirror and see a gray curtain behind. The snow is light and bright and uplifting in the winter. The weather is quite warm in the summer months. A great change for a weekend or longer! The Log Home provides a SOLITUDE, PEACE, AND BACK TO NATURE enviroment. The wildlife is awesome to watch right from the front or back deck. Nearby you can drive to areas such as Salmon La Sac, Cooper Lake, French Cabin Creek. These areas are wonderful areas for kayaking, canoeing, bicycling or just hiking. In the winter months the log home can only be accessed by snow mobiles. Just park your vehicles in a specified location at the bottom of the hill, load up your snowmobiles and ride up to the log home. The 'Ridge' can be accessed from the log home where you can ride your snowmobiles for miles and miles. Then ride back to the log home and enjoy dinner in the crock pot! The Log Home has two full bathrooms and one half bathroom. Clean towels, and a bar of soap will be provided. Lake CleElum glissens all year round. Apple TV, airport express, Lake Cle Elum is less than a mile away for motor boats. Cooper Lake is about 8 miles away for Kayaking and swimming. Suncadia Resort is several miles away and fun for dining, walking, spas, winetasting, golf and lots more! Great place to make lasting memories. We love this log cabin. It is a great place to bring your family, relax, laugh, play in the beautiful snow and make memories that will last a life time. Nice layout and property! Great for families. Easy lake access. This cabin is fabulous! Spacious, comfortable and really well kitted out. We had everything we needed for a week stay this summer. Randy was great, such a nice guy and he went above and beyond to ensure our group of 8 had a fantastic trip. Our highlights were paddle boarding at Cooper Lake and sitting out on the huge back deck watching the Perseid meteor shower!! Highly recommend this cabin! I can't say enough beautiful things about this house and the owners! They were always available and answered all my questions in matters of minutes! The house will leave you speechless. Plenty of space, detailed, clean and in great condition. Very family oriented. Loved it!! The view of the lake makes you want to live there forever. Thank you Randy and Julie for sharing your house! Loved our stay here! Pictures do not capture how nice it is or the stunning panoramic view! The log cabin was a perfect place to celebrate our friends 40th birthday! House was spotless, beds were comfortable, kitchen was great to cook in and had everything you need, and a great deck with an awesome panoramic view of the lake for lounging. We also loved the horse shoes and pool table! Thank you so much for leaving the cabin in such perfect condition. We hope you will return again! The Log Home is within 5-6 miles of so many fun things to do. ~Lake Cle Elum is in view from the back of the home and is less than 1 mile away. Motor boats, Seadoos are perfect. And best of all its rarely crowded. You can launch a boat at Speeliy Beach which is less that a mile away. In the winter months, the roads to the cabin are closed and only accessible by snowmobiles. ~Suncadia has golf, ice skating, spas, dining, wine tasting and so much more. 5 miles away. ~ Enjoy The Brick Saloon with is the oldest saloon in the State of Washington. It also has the famous running spittoon. ~The historic 'segregated cemetery' is interesting and a great walk through Roslyn. ~The Roslyn theater has the newest movies and is very affordable. You might even have a pet cat jump up on your lap purring during the movie! ~Cooper Lake is a prestine setting that is perfect for kayaking, swimming , hiking or just having a picnic. ~French Cabin Creek and Salmon La Sac are also known for their beauty as well as peace and quiet environment. ~The infamous Bavarian town of Leavenworth is just over an hour drive. You can visit the quaint town and shops, have lunch in any of the restaurants. Or just have a German beer and Braut at an outdoor pub. Usually Bavarian music is live and the town is famous for its Octoberfest! A must see if you have never been. The first part of December Leavenworth has a tree lighting festival. So festive and fun. Wear warm clothing! ~The Yakima River and Lake CleElum are nearby for Fly fishing, or catch and release! Rates are subject to change. Holiday rates variey. Ask owner for details.